Can the right knife really make food taste better? In a word, yes. 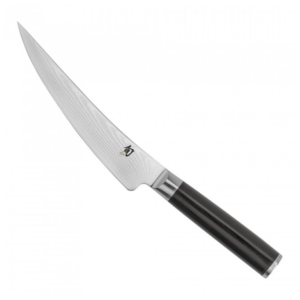 The Shun Classic 9-in. Hollow-Ground Slicing Knife’s long, narrow blade allows you to make a cleaner cut, which helps keep more of the juices—and thus more of the flavor—trapped in the meat. The longer blade lets you make precise slices with a single stroke, while the narrower profile and hollow-ground indentations help the blade glide through the meat with even less friction. Producing thin, beautiful, even slices of meat isn’t hard—when your have the right knife. 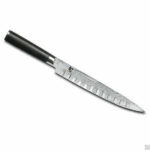 The Shun Classic Hollow-Ground Slicing Knife is the right knife. 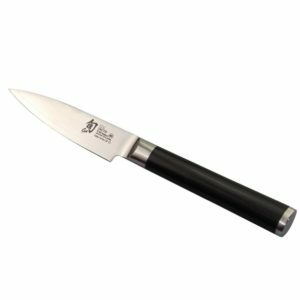 The Shun Classic Hollow-Ground Slicing Knife is part of the Shun Classic line of tasteful and contemporary cutlery. 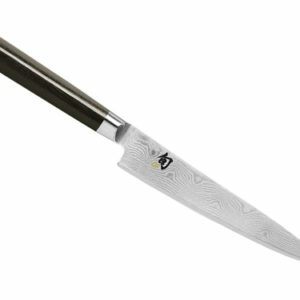 The Shun Classic line features beautiful Damascus-clad blades and D-shaped ebony PakkaWood handles. Yet behind these handcrafted knives’ beauty is function: razor-sharp blades offering top performance. 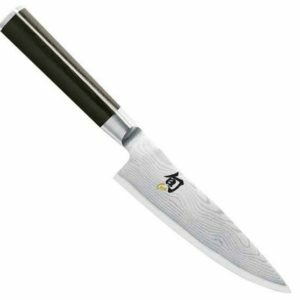 Shun’s proprietary high-performance VG-MAX steel, which provides incredible edge retention, is clad with Damascus stainless steel, then ground and bead-blasted, revealing the flowing pattern of the layered steel. 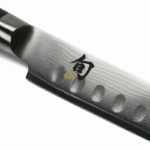 The result is a line of knives that are sharp, durable, and corrosion resistant, as well as beautiful to behold. 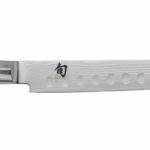 The Shun Classic line also offers you the widest assortment of both traditional culinary blade shapes and cutting-edge designs, so you can always find the right knife for the task.